Remembering Lions is the fourth book in the highly acclaimed Remembering Wildlife series of charity books and features a foreword by Jonathan & Angela Scott. 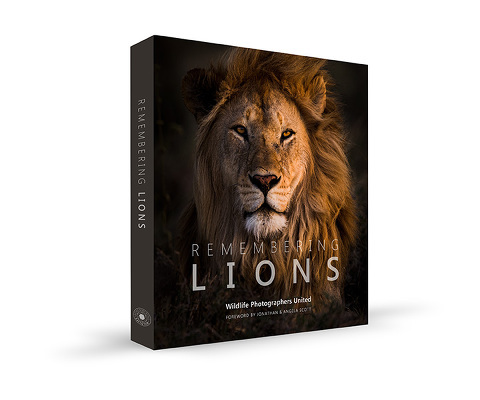 The book is full of beautiful images donated by more than 70 of the world's top wildlife photographers including Marsel van Oosten, Frans Lanting, Art Wolfe, Steve Winter and Michael Poliza, with an aim to raise awareness of the plight facing lions and also to raise funds to protect them. A highly successful Kickstarter campaign has raised £163,904 to pre-fund production (thank you to everyone who supported us!) meaning we can produce this next edition with all profits once again going to conservation projects, this time ones protecting lions. During April 2019 (until 28th April) we are running a competition for 10 places in the book. To enter click here. There will be a public launch of the book at London’s Royal Geographical Society on Thursday 17th October 2019 (tickets will go on sale May 1st), along with a free two-week London exhibition from Monday 14th October to Saturday 26th October 2019, details on that to follow. Adam Bannister, Albie Venter, Amy Shutt, Andrew Aveley, Andy Biggs, Andy Rouse, Andy Skinner, Anja Denker, Art Wolfe, Billy Dodson, Brent Stapelkamp, Chad Cocking, Chris Schmid, Clement Kiragu, Daryl Balfour, David Lloyd, Federico Veronesi, Frans Lanting, Greg du Toit, Hannes Lochner, Heinrich Neumeyer, Hilary Hann, Isak Pretorius, James Giifford, James Suter, Jami Tarris, Jan van der Greef, Jonathan & Angela Scott, Karine Aigner, Keith Connelly, Kyle de Nobrega, Marcus Westberg, Margot Raggett, Marius Coetzee, Mark Dumbleton, Marlon du Toit, Marsel van Oosten, Melissa Groo, Michael Lorentz, Michael Poliza, Morkel Erasmus, Nelis Wolmarans, Paul Goldstein, Paul Joynson-Hicks, Pete Oxford, Piper Mackay, Richard Peters, Roger Hooper, Ross Couper, Roy Toft, Sabine Stols, Sarah Skinner, Shem Compion, Steve Winter, Suzi Eszterhas, Theo Allofs, Thomas D Mangelsen, Todd Gustafson, Tom Way, Tristan Dicks, Will Burrard-Lucas, Willem & Tanya Dekker.